It's time to redecorate some of our guestrooms. Having just returned from our national B&B Association's Annual Conference, I'm full of ideas for improving our rooms with guests' comfort and new preferences in mind. Today was a very busy day of implementing some of the ideas I got at the conference. In "Boxwood Cottage", we moved the love seat out of the bedroom, rearranged the remaining furniture and added a "faux fireplace". The result is that the room looks bigger and there is a certain touch of romance from the fireplace too! We finished this part of the project just before the guest arrived to check-in so I did not get a chance to snap any pictures. The pictures will be coming later in the week. We hope you will enjoy these changes the next time you need a quiet getaway. We made some other changes in "The Pet-sylvania Room". We rearranged the furniture and I'm looking for some new lighting fixtures to illuminate each side of the bed independently for late night reading. We are also working on a small project to allow us to display more pictures of our animal guests. 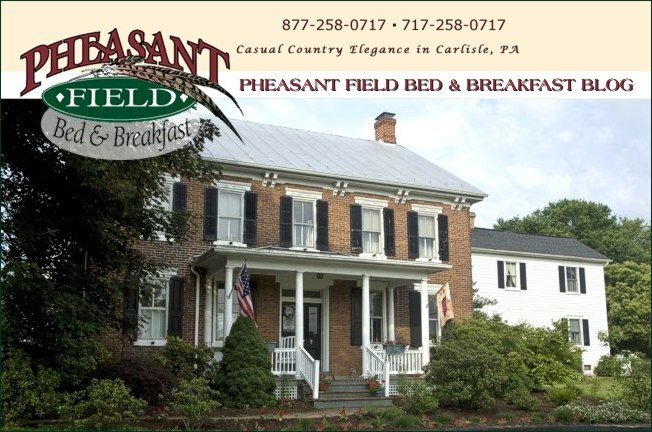 Be sure to bring a picture of your pet along with you when you stay in our pet friendly rooms at Pheasant Field B&B. More "B&B makeover" changes coming! Keep watching for the details here.